At least during Watergate officials inside the administration refused to collude with Nixon’s orders. James Comey is out at the FBI, and comparisons to Nixon’s Saturday Night Massacre are in—but that’s exactly the wrong comparison. In Washington, people get fired all the time; what distinguished the Saturday Night Massacre was refusal. It began with Watergate Special Prosecutor Archibald Cox’s refusal to compromise in his demand for Nixon’s Oval Office tapes; and then refusals by Attorney General Elliot Richardson and Deputy Attorney General William Ruckelshaus when Nixon demanded that Cox be fired. Thus far, the Comey story is the exact opposite: It is all about collusion—the endorsement of Trump’s action by Attorney General Jeff Sessions; the thin, just-following-orders support memo by Deputy Attorney General Rod Rosenstein; and the muted response of Senate Republicans, at least in the first hours after Comey’s firing. Collusion in formerly unimaginable words and deeds has defined the Republican leadership’s relationship with Trump from the moment he seized the party’s nomination, and if the firing of Comey is any indication, the limits of the palatable have just moved outward another yard. Yes, James Comey is a complicated guy. As Attorney General John Ashcroft’s deputy in the days after 9/11—the same job that hatchet-man Rosenstein holds today—he was part and parcel of the Bush administration’s assault on civil liberties: undermining the FOIA, enshrining the Patriot Act, unleashing a rendition-and-torture regime in self-evident violation of American and international law. But Comey eventually decided enough was enough, and in 2004 rushed to an ailing John Ashcroft’s side to block the Bush White House from reauthorizing its warrantless wiretap program behind Ashcroft’s back. That day, Comey—looking over his shoulder at the Saturday Nigh Massacre in a meaningful way—orchestrated the threat of mass resignation by Ashcroft, himself, FBI Director Robert Mueller, and other high-ranking officials. That particular day in 2004, Comey chose Constitution and conscience over collusion. And, of course, once Obama appointed him FBI director, Comey kept Robert F. Kennedy’s letter to J. Edgar Hoover authorizing the wiretapping of Martin Luther King on his desk as a daily reminder of the Bureau’s worst abuses. 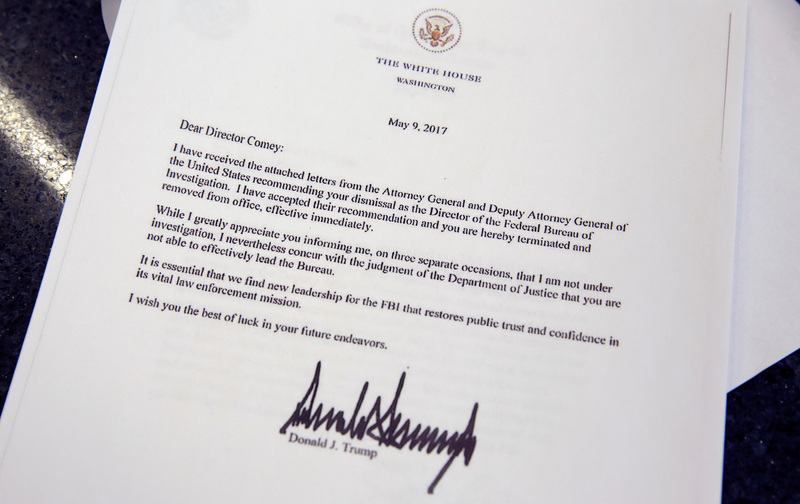 Presumably, that letter is still on Comey’s now-unoccupied desk. Any bets on whether it is still under glass three months from now? Comey was an intemperate, bafflingly tone-deaf FBI director. In normal times, a normal president might even reasonably wonder if he was the wrong person for the job. But these are not normal times or a normal president and this is not—cannot—be a normal firing. Not when the Trump White House phonebook is a conflict-of-interest tasting menu. Not when the president’s former campaign manager and former national security adviser are each under criminal investigation for violating the Foreign Agents Registration Act and other statutes. Not when the attorney general has had to recuse himself from the Senate’s and FBI’s competing election-hacking investigations because of lying about his contacts with Russian officials as a Trump surrogate. For this president, under these circumstances, to fire the director of the FBI and hand-pick his successor brings us, with astonishing speed, to the brink of a constitutional crisis. (Just imagine the reaction in Washington if Putin or Chavez had pulled this stunt.) Whether we go all the way over the edge depends on whether any spirit of refusal can be awakened in Donald Trump’s Washington. The signs aren’t promising.